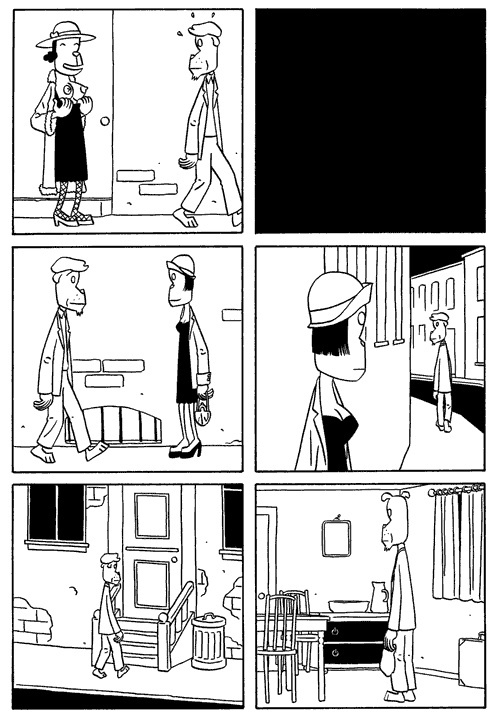 Jason came out of left field for many comics readers, with a touching and memorable debut (Hey, Wait...) in Fall 2001 that showcased a distinct art style and approach to narrative unlike anyone else's in comics. Every release since -- Jason is a highly prolific cartoonist who does both black and white work and color albums -- has brought to center stage some delightful new aspect of his work, from humor to pathos to the intricacies of historical fiction to the visual demands of a thriller, all of them set in that wonderfully idiosyncratic visual world. 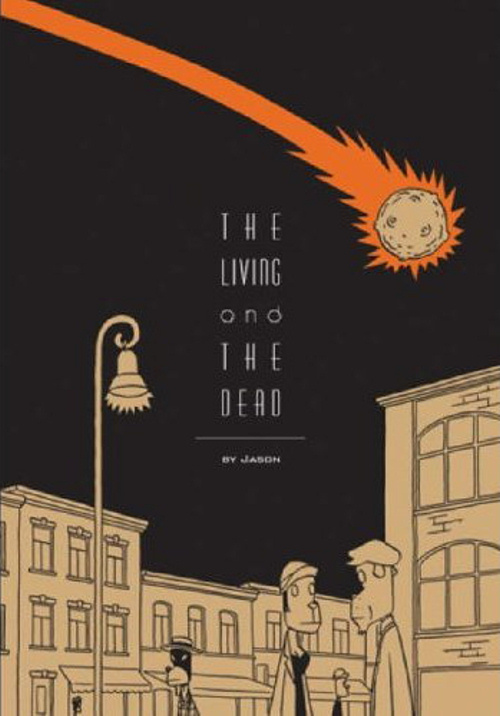 The Living and the Dead is a comics novella due next month from Fantagraphics that manages to combines romance and zombies in a way where it's not until you think about it that you realize you've just read a comics about romance and zombies. It's both funny and soulful and, like most of what Jason does, its own thing. The first four pages run the length of this interview; I didn't dare cut them up in a way that left anything out. TOM SPURGEON: Jason, can you give us an idea how you create and coordinate your work with your various publishers? Is there one of your publishers that generally publishes material first? 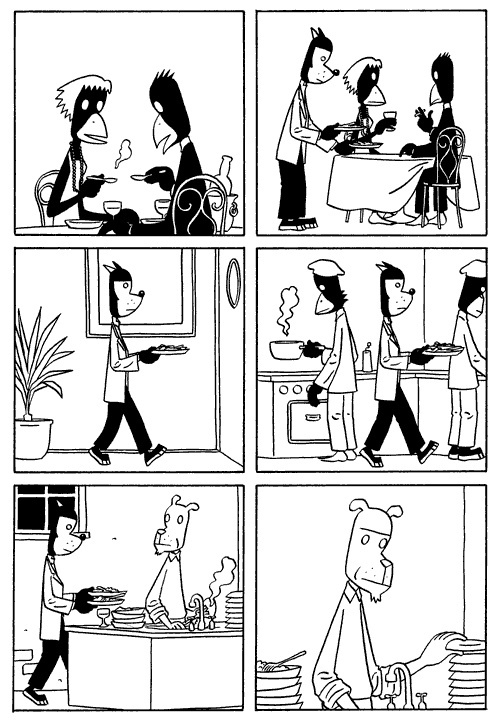 JASON: Originally I did a series of comic books called Mjau Mjau for my first publisher in Norway, Jippi comics. 10 issues were published. Those were then collected as books, by Jippi but also by another, bigger, publisher, Schibsted. "You can't get there from here" were done directly for them without first being published in Mjau Mjau. I've never had a day job I've liked. I want to do comics as a living, but that's hard doing black and white work. So a few years ago I wrote a script for a colour album and sent it to different French publishers, hoping to get a deal there. Carabas accepted, they published the album, "Why are you doing this? ", and the colour albums I've done later have been done directly for them. I write the script in English, they translate it into French, and the album is then later published in Norway and the US. SPURGEON: Is Fantagraphics still playing catch-up in terms of your back catalog? Do you want to get to the point where you're releasing material in several languages at the same time? JASON: Fantagraphics is about a year behind. I'm sure they'll catch up eventually. I guess there is some money to be saved in doing multi language printing, but it's not important for me that the books are released in several languages at the same time. SPURGEON: Am I right in remembering you spent some time living and working, not just visiting, America? JASON: Yes, I spent three months in New York and then later three months in Seattle. I didn't have a visa so that was the limit. I'd been in both cities earlier for shorter visits. New York is a very impressive city the first time you're there. You can't help but want to come back for a longer stay. I got the chance later by subletting an apartment in Brooklyn. This was in the summer, so mostly I remember how hot it was. I didn't get any work done. For the most part I walked around in Brooklyn or took the subway into Manhattan and looked at the skyscrapers like any stupid tourist. Eventually my feet would get tired and I'd find a park, sit down on a bench and look at the squirrels. After three months though, I'd had enough. It's just too big and noisy, too many people. Seattle I enjoyed more. I had expected it to rain half the time, but it only happened a couple of times so that was very disappointing. I got some work done while I was there, the first half of Left Bank Gang, but I got to walk around and look at the city also. I really liked the bookstores a lot, like Elliot Bay and Half Price Books. I bought a ton of books, and it cost a small fortune to ship it all to Norway. The election took place while I was there, so that was interesting to follow. I drank a lot of coffee. SPURGEON: What effect did you hope to achieve through the silent movie-style panels of dialog, as opposed to, say, going with an all-silent approach? Why is that effect dropped after a certain point? JASON: I've already done completely wordless strips, like "Shhh! ", so that was no longer a challenge. I wanted some dialog in the beginning, mostly to say something about the characters. After that introduction though that was no longer necessary. When the zombies show up it's pretty much all action, one big chase sequence, that worked better with no words. SPURGEON: You have very fervent, very devoted fans in the U.S. Do you have any sense of who is reading your comics, who you're reaching? Have sales met your expectations? JASON: I've not really had any expectations at all about sales. Better European cartoonists than me have had problems breaking through in the US, so I'm just happy the books are selling and seem to be well received. I get some impression of the readers from signings I've had. Mostly young people, not that different from the readers in Europe. No stalkers. SPURGEON: How do you construct your gags? The Living and The Dead has a lot of really well-staged gags in it, my particular favorite being one involving a bottleneck of zombies at a cab. Do you work these out ahead of time, do you change the staging? JASON: Of course, the bottleneck car is an old silent film gag, the new thing being that they are zombies. But I'm glad you enjoyed it. I was a bit unsure of it being clear enough in the last panel. I don't really have much else to say. It's very much visual storytelling. I don't have a script, it's all made up as I go. I had one or two gags in my head before I began the book. It was only a matter of putting them in the right place. 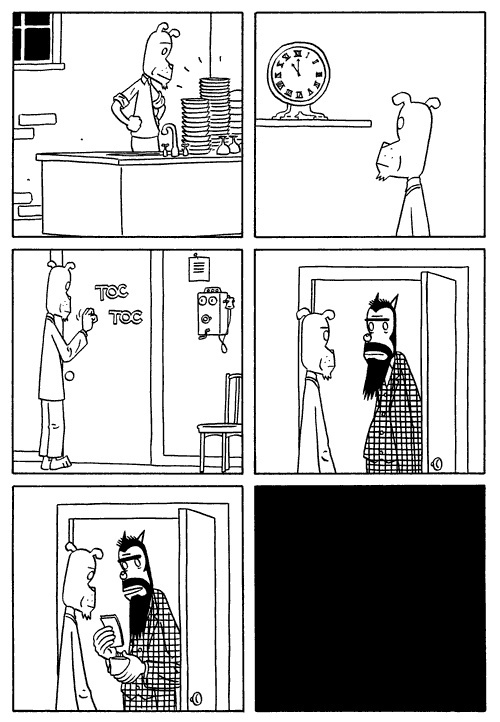 You try to put the punchline on the last panel, and not have the reader turn the page to see it. SPURGEON: The ending to The Living and The Dead is really rueful and sweet; do you want readers to take away some kind of moral from a work like this, some kind of statement of values or expression of things you find important, or would just rather have them read it according to its general content? What would you have people take away? JASON: I hope they will be entertained, that it gives them some sort of experience by reading the story, that it's funny or sad, maybe both. There are no messages there. I'm not sure if I trust any cartoonist, writer or filmmaker that chooses the theme or message first and then tell the story. Then it becomes just preaching. If there is a theme then that is something you discover while you are working. SPURGEON: Are you happy with how your work represents your career to date? You've worked in a number of areas, such as straight-up gag humor and historical drama... has what we've seen so far given us an accurate portrait of your interests or are there still genres or types of narrative you want to explore? JASON: A lot of people mention Hey, Wait... as a favourite book. I'm not sure how representative that book is any longer. It's a book I find hard to look at now. I'm not happy with the drawings, and it's a pretty dark book. I'm not even sure where that story comes from now. "Left bank gang" and "Living and dead" are closer to the type of stories I want to tell, just playing around with genres. A lot of my favourite books and films are genre stories. There are some rules you have to follow, but at the same time you have a lot of freedom to put in whatever you want. You can slightly mock the genres but at the same time try to achieve what's fun about them. I think I'll stick to fairly short stories, 40-60 pages. I don't have any plans for any fat 300-page graphic novels. I admire people like Jason Lutes or Charles Burns that can spend 10-15 years on one book, but I'd lose my mind if I did that. Even the 48-page albums that take five to six months to do, at the end I'm just sick and tired of the whole thing. I think you'll see in a lot of my books that the first half is better drawn than the second half. SPURGEON: How important to you are issues of page design, a sense that each page must work as its own unit within the larger story? It seems like a lot your pages are stories in and of themselves, or discrete story moments. Is that intentional? JASON: The page design is very important to me. I see each page as a unit and also have the spread in mind. I try to give each page an energy, rhythm and balance. 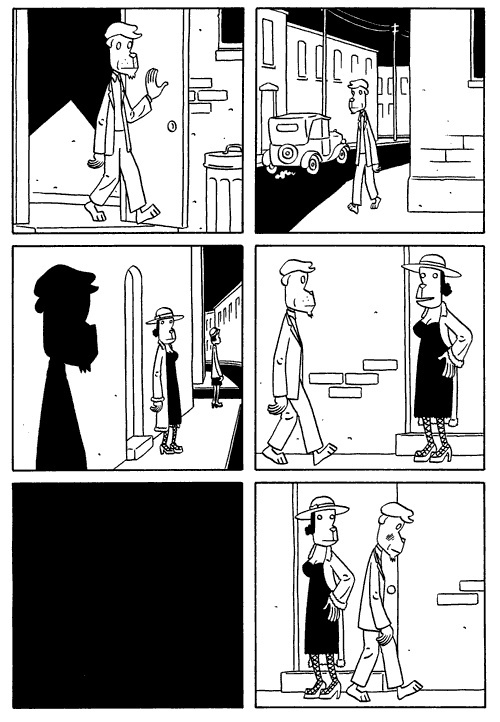 The most important thing for Herge was readability, and I try to learn from him. That's also my favourite part of the cartooning, the early penciling. Solving the storytelling problems and placing the characters. Movement on the page, how you lead the reader's eye, that each page is a satisfying whole, maybe even that something exciting happens in the last panel! Hey, wait... and the first half of Left Bank Gang were both books where I had each page or sometimes two pages be one sequence. It's almost like a series of poems. Another thing you achieve is that the book becomes easier to edit. You can work out of order, just putting the pages in correct order at the end. If a sequence doesn't work you can just take it out, you don't have to put in anything else instead. SPURGEON: What kind of effects can you get as a cartoonist get out of working in a really rigid grid like the six-panel grid in The Living and The Dead? Does it help you in working out a narrative to make that kind of decision beforehand? JASON: It's mostly an aesthetic reason I like the grid, either six panels or nine, as in Left Bank Gang. It just looks good to me. It's not messy. Also, I find it easier to sketch out pages when you know how the page looks. You don't have to make new decisions for each page. SPURGEON: Is the next project I Killed Adolf Hitler? JASON: The next book from Fantagraphics is I killed Adolf Hitler. It should be out in the summer. I'm currently working on the next color album. It will be called The Last Musketeer and is mostly influenced by old film serials from the '40s like Undersea Kingdom and Flash Gordon. I hope it will turn out good, but who knows. SPURGEON: Congratulations on having Adolf Hitler named one of the essential comics in Angouleme's initial "Essentials" list. I know nothing about your book, but I know Walter Moer received some heat for doing comics about Hitler; has there been any backlash at all concerning your book? JASON: So far no one has given me Hitler salutes or called me up in the middle of the night to say "Sieg Heil." But the book is not really about Hitler. He's just in eight or nine panels and with no dialog. Note: The black panels above have white lettered-dialog in them in the final copy: "Don't spend it all in one place!" (page 2), "Hey there, big boy! Looking for a good time!" (page 3), "This'll give you something to dream about tonight." I apologize for my poor computer skills.